Khama Rhino Sanctuary is a beautiful community based wildlife project that was established in 1989 in order to save the dwindling Rhino population in the area. It has, over the years, reestablished the once populous wildlife area. The 4300 hectares of land that the sanctuary covers is prime location for both black and white rhino as well as more than 30 other game animals and a staggering 230 bird species. Khama Rhino Sanctuary Trust grew into a community building expedition and over the years has provided economic benefits to the local community mainly through tourism. Located only 3 hours away from the bustling historical city of Francistown, Khama Rhino Sanctuary is often used as a route through to many other areas in northern and north west Botswana including Okavango Delta, Gaborone, Maun and even into Zimbabwe. Day visitors from Francistown and surrounding areas enjoy the ease at which so many animals can be seen. It is highly unlikely that a visitor will go a day without seeing at least one of the sanctuaries 35 rhino. Khama Rhino Sanctuary has also become a popular stopover for many people who are tired from the long drives between destinations. After the devastating decline of the rhinos before 1989 KRS was established by the people of the neighboring town of Serowe. Led by paramount chief Lt. Gen Seretse Khama Ian Khama and other conservationists, the building of the sanctuary began and in 1992 the first four white rhinos from Chobe National Park where introduced. Then later on, eight more from North West National Parks in South Africa where also introduced into the park. A gamble was taken in 2002 when the highly endangered and targeted black rhino was introduced into the park. Major celebrations where held in 2008 when the first baby black rhino was born in 2008. To ensure that the rhinos are well protected the Botswana Defense Force patrol the boarder of the park constantly and staff at Khama Rhino Sanctuary dedicated their time to ensuring the rhinos safety. Due to the unbelievable help and undeniable hard work from many dedicated individuals, the park is prospering and has reintroduced rhino back into many surrounding reserves and parks. The Moremi Game Reserve as well as Makgadikgadi and Northern Tuli Game Reserve have benefited from the sanctuaries conservation efforts by receiving rhino from the sanctuary. Khama Rhino Sanctuary reestablished rhino populations back onto their land and are continuing to grow and do more. 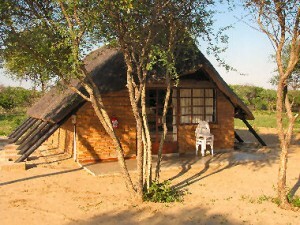 The sanctuary provides basic self-catering accommodation to visitors staying at the park. Visitors can stay in either the campsite on the grounds which has clean ablution blocks or well equipped chalets with en-suite showers and toilets. Well maintained roads lead to the sanctuary and 4x4s are not needed to visit so the sanctuary a pleasure for visitors. Campsites are not fenced so animals roam freely making the experience that much more memorable. Guided game drives by exceptional friendly and well experienced rangers are a highlight of many visitors trips.